Welcome to join our tour to Italy and experience the most beautiful tracks in the lovely Dolomites! 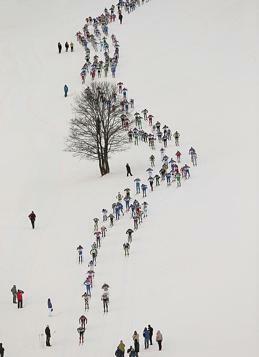 At the end of January every year, Italy's equivalent to Vasaloppet is held. 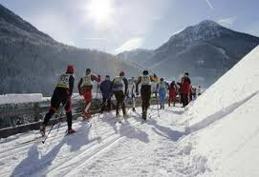 Classical Marcialonga invites you to 70 or 45 kilometers of Cross-country skiing through 13 small mountain villages surrounded by majestic limestone mountains. The setting is outstanding. Our ordinary tours for non-scandinavians include staying at a four star hotel in Moena. On this page, you find a more economic package where you, 4-6 persons, stay in apartments in either Moena or Cavalese. You will be more independent but still have your registration in the race included in the price and your startkit with bib delivered to your door. 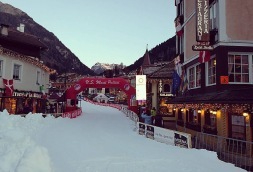 The race starts in Moena and the Finish is in Cavalese. In either village, you can cook your meals at home or visit some of the excellent restaurants. If you stay in Cavalese, you also have access to an indoor pool and a nice spa to limber up your muscles in. 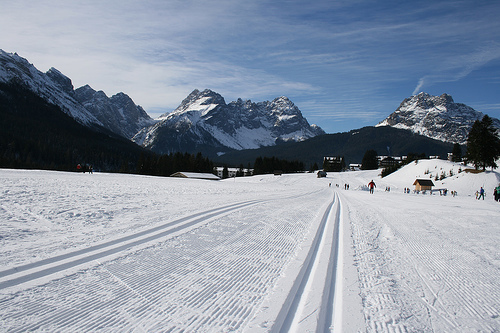 During the days prior and after the race, you will enjoy skiing in famous cross-country areas in San Pellegrino, Val di Fiemme, Val di Fassa and Alpe di Suisa. If you want to ski down-hill, the possibilities are abundant. 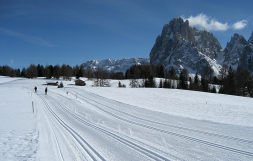 You can easily reach the enormous Dolomiti Superski with well-known places such as Val Gardena, Canazei and Arabba. We promise delightful nature experiences, fantastic skiing and divine Italians who master the art of making you feel at home. Good food and drinks come along as a bonus. For the fifth year in a row, we have received confirmed registrations in Marcialonga where all participants get the latest information straight from the organizer. 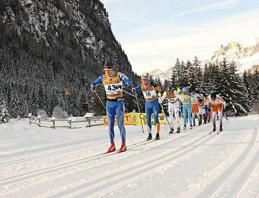 We are official tour operator partner to Marcialonga which entitles you and us further advantages. The tours are popular and always fully booked. Welcome to join us to Italy! Let yourself be inspired on our website and surf around on a computer and not only in your mobile - you will get an even better impression of the tour on your computer. 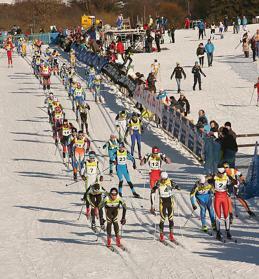 Profile of Marcialonga. Please click on the picture and you will get a larger one. Thursday - Check-in to your apartment. Headlamp skiing for enthusiasts. Friday - Cross-country skiing in San Pellegrino, Moena-Canazei, Moena-Predazzo, at Stadium of Lago di Tesero, or in Lavazé. Downhill skiing in Alpe Lucia or Canazei in Sella Ronda. Ski waxing lesson in Moena in the evening. Saturday - Skiing like on Friday, visit the Expo. Waxing and preparations for tomorrow's race. Waxing lecture in Moena. Sunday - On your marks! Marcialonga and Celebration Dinner at a very special restaurant in Moena. Monday - Spin down (cross-country) for those who wish. Check-out from your apartment. When you reach the Finish line after 70 or 45 kilometers, you will get a medal, pasta, your bag transported from the start, shower, a great party and free bus back to Moena. If you stay in Cavalese, you can walk straight to the spa from the Finish line. In the evening after the race, you are welcome to take part in our celebration dinner - it tastes super! 15 minutes by foot from central Cavalese, 4-6 people are invited to share an apartment with all facilities plus indoor pool and spa. From the Finish line, you just walk home. At the central square, a group of 6 persons, are welcome to share an apartment in a private house. 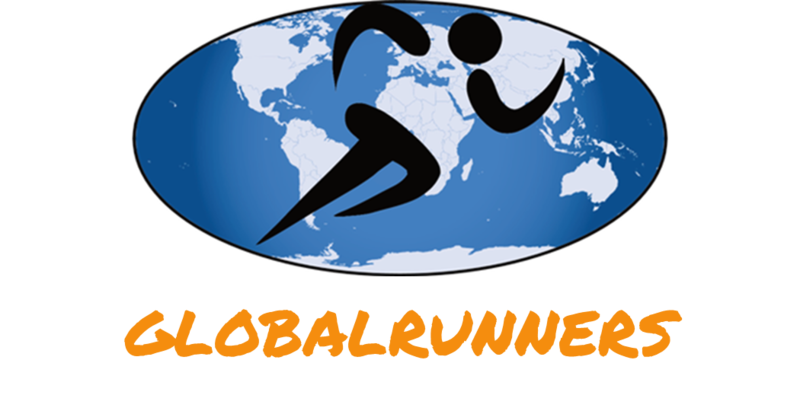 You have shops, restaurants, waxing service and Globalrunners at 5 minutes distance by foot. To the race start, it is a 15 minute walk. Flights or traintickets and transfers are not included. If you want to arrive or depart earlier or later, please let us know and we will arrange this for you (depending on availiability but there should not be a problem).